Counting low-income students is an annual fall rite at most districts, which use the data for a variety of programs, but this year the count matters more than ever. Under the K-12 finance formula signed by Gov. Jerry Brown in July, districts can receive additional funds for every high-needs student enrolled – as much as $3,000 per student once the formula is fully funded over the next eight years. High-needs students are defined as low-income, English learners or foster youth. Among the unknowns in this first-year rollout of the funding formula is the number of low-income students who aren’t signed up for free- and reduced-price meals, and won’t be included in the count. 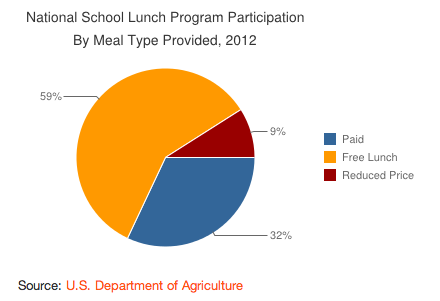 Researchers believe that high school students are greatly under-enrolled in the school lunch program, possibly because of a perceived stigma of receiving free lunch, according to the Federal Education Budget Project, a Washington, D.C.-based nonpartisan and nonprofit research group. Cullen says that’s all the more reason for districts to make sure they are identifying every low-income student. Oakland Unified has embarked on an ambitious campaign to do just that. “There are a lot of high school and middle school students who aren’t signed up,” said Jennifer LeBarre, executive director of nutrition services for the district. To entice more teens and their families to sign up, the district is holding a contest pitting middle and high schools in the district against one another. The schools that sign up the most students for the lunch program will receive free tickets to Oakland Raiders games to hand out to students and their families. The district is handing out 1,400 tickets in all, donated by the Raiders. The district has also embarked on an advertising campaign to encourage families to sign up. Banners at Oakland schools proclaim: “Meal applications provide more than just a free lunch!” and tout the potential benefits to schools, including “millions of dollars for Oakland students.” The district is also spreading the word that families in the free- and reduced-price meal program are eligible for other perks, including discounts on Internet service through Comcast, discounted fees for the Advanced Placement and SAT exams, and free after-school programs. About 67 percent of students in the Oakland district are currently enrolled in the meals program, LeBarre said. Officials hope to get that number to 80 percent. Each low-income student would bring an additional $2,006 a year to the Oakland district once the finance formula is fully implemented in eight years, she said. With 36,000 students in the district, the money quickly adds up: Every 1 percent gain in enrollment in the meals program would bring an additional $200,000 to the district for the 2014-15 academic year alone, district spokesman Troy Flint said in an email. 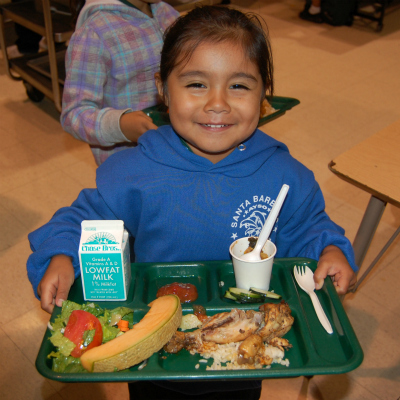 Oakland is not alone in wooing families to sign up for meals. In Fresno, 55,000 free student tickets to the Big Fresno Fair are being offered to students that turn in meal application forms, whether they qualify for the meals or not. Ice cream parties, awards, phone calls from teachers and daily email updates on meal program enrollment numbers are among the motivators in the Coachella Valley Unified School District, where all of the elementary schools are in the midst of collecting information to identify low-income students. “We’re doing whatever we can to make sure students are correctly identified and get the resources they can,” said Zim Hoang, testing and assessment coordinator at the Coachella district. Other districts have taken a more low-key approach toward spreading the word that schools can reap additional money based on how many students are eligible for subsidized meals. Long Beach will, however, include information on the new Local Control Funding Formula and the importance of signing up for the meals program in automated phone calls to district families next month, Slater said. In many districts, signing up families for free- and reduced-price meals is already an efficient outreach operation that includes mailing forms home in summer information packets, handing out fliers at school registration, sending follow-up letters and initiating automated phone call reminders. The sign-ups are important not only for the meal program, but also so that schools can qualify for federal poverty programs such as Title 1, which brings money for instructional assistance. But other districts are just starting to recognize the financial importance of identifying every low-income student. H.D. Palmer, spokesman for the California Department of Finance, agreed. This is what happens when Big Government gets involved in just about anything. Whatever it is, it is bigger, more complex, far more expensive, accomplishes less and encourages loose behavior, because the recipients, can always count on the Government to provide cell phone service (which everybody with a cell phone bill pays for), food, babysitting, house rent and even fixing your car. All those ‘children’ soon reach sexual maturity and guess what? Many of them get pregnant so as to reap the generous benefits widely available at somebody else’s expense. One day, the gravy train will derail, because of the lack of money, excess government debt and the refusal by investors to hold State Bonds. Here’s the thing. The pot of money available to fund LCFF won’t change based on how many families sign up – it’s how much the state gives to K-12 education that funds LCFF. So while the LCFF target amounts for districts will go up if their low income numbers go up, the actual dollars a district receives (the funded part of LCFF – 12% of the gap between base year and target for 13-14, ??? for 14-15) won’t be affected. Here’s the thing, Kim: while the total amount of money available for the supplemental and concentration grants (which depend on the number of kids defined as “in need”) depends on what comes into the state’s coffers, the amount that a district will get will depend on the number of kids it identifies as “in need.” It’s a distribution problem: if a district has more kids in need, it will get more of the available money. As for counting the kids eligible for the NSLP, that’s another story. Some districts, like LAUSD, are not very helpful when it comes to collect that data. They leave it to the local principal to do it, and they, in turn, end up leaning on parent volunteers to beat the bushes. And, navigio, I’m under the impression that only the state can do the verification. But I could be wrong. So how is the income stated on the sign up form verified? Or is it? Does it matter? Rates of fraud in these kinds of programs are very low and it seems like a big risk for someone to take for something that is not a direct benefit for the parents. There are various income verification systems but they cost money to use and might cause more harm than good (current non-use of employment verification system is a good example). Anyway, from my understanding school districts are allowed to do verification. Whether there is any incentive to is a different matter. Tongue in cheek I presume. Unfortunately, it seems that fraud rates are quite high in the school lunch program. According to one source, LAUSD drew a verification sample of 3,401 participants in 2007-2008, and ended up reducing or repealing benefits for 93% of the sample! Total district enrollment (including lunch program participants and non-participants) stood at 700,000, so the sample size itself was laughable. There are, in effect, no penalties for parents, school districts, or school district officials who abuse, or allow abuse of, the program. While it is frustrating that some parents would lie to obtain a $3.21 lunch benefit, and criminal that anyone but the most impoverished* parent would allow his or her son or daughter to eat a shrink-wrapped, processed, microwave-reheated school lunch consisting of unsaleable surplus agricultural products (bought by the federal government not for the sake of providing food to children, but rather, for sake of subsidizing factory farms by propping up commodity prices), prepared under regulations that treat french fries and pizza sauce as “vegetables”, I’m not really worried about individual abuses. In the context of LCF, we’re not talking about $577.80 a year (= $3.21 x 180) of juice boxes and microwave hotdogs for consumption by an individual student, but rather, about multiple thousands of dollars in supplemental funding per student, for consumption by a school district. It’s the potential for school district abuse that worries me. And yes, though the state must provide a supplementary allocation for every student who appears to qualify, there are limits, both practical (actual tax revenue) and political (Proposition 98), to the overall K-12 funding envelope. If we want to do as much as possible for poor children, we must make sure that every dime of supplementary money goes where it is needed. Trend analysis, a much higher verification sampling rate, and substantial fines for school districts and district officials when overcertification occurs, would seem to me to be necessary to prevent school districts from gaming the LCFF. * As a side note, I see the school lunch program as one of the worst examples of discrimination against Americans who are truly poor. In the private schools I’ve visited — and in public school districts with a combination of substantial local tax resources and activist parents (Berkeley Unified, Santa Cruz City Elementary, etc.) — children feast on fresh, organic fruits and vegetables and chef-prepared meals. Why won’t Congress fund the school lunch program at that level, uncouple it from the surplus food purchase/agriculture price support program, and stop overruling rational nutrition guidelines? Poor children already tend to grow up in “food desserts”, far from decent food stores. There is a reference to an annual audit requirement for large programs, but I didn’t find any information about verification of individual applications. The audit seems to be a fiscal audit (are funds being spent on allowable expenses, such as food), not an eligibility audit. Do a keyword search on “tomato”. The french fry provision appears on the next page, but it is couched in terms of withholding funding from lunch programs that limit servings of vegetables or are inconsistent with the definition of vegetable in a certain edition of the Dietary Guidelines for Americans. The intent? Unlimited servings of starchy vegetables — fries, Tater Tots, etc. Hi Paul. Thanks for the links. I don’t know that that report is very conclusive given that between 80% and 90% of ‘participants’ simply did not respond to the verification request. Especially that as the non-response rate dropped, so did the ‘fraud rate’. It’s noteworthy that the Mathematica survey estimated over subsidized rates much lower, and in fact there was a non-trivial percentage who should have been getting more. That said, if the fraud rate were actually what was indicated by non-response, lausd’s SED rate is actually below 10%. The fact that that differs so greatly from what is reported is just another example of the fact that the idea of transparency in this state (and country) is just a big joke. And I guess the correlation between test results and reported income are probably because there are questions on the cst on how to properly fill out an ‘f&r application..
‘Efforts to authorize an audit came crashing down in September when the USDA threatened to cut off the district’s $34 million lunch-program subsidy for the 2007–08 school year if it proceeded with a full verification. School-district attorneys subsequently received a written order from the USDA saying that an audit beyond the mandated 3 percent would be illegal under federal law. Also, EducationNext is a conservative advocacy organization and not an impartial source, so its material should not be viewed, rereported or treated as scholarly credible research. Whether there is a CAPACITY for school districts to do the verification is another matter too. How? Whose job would it be? Cant something like eligibility for the food stamp program also be used as an ‘automatic’ qualifier? Thanks jskdn! That looks like it would do the trick and it appears would not even require any effort by the families involved. Jane, is there any reason we’d expect districts to not use this? So perhaps the biggest group of students remaining to be classified would be those who might not qualify for some of these programs because of the residence status. I forget which programs have that as a qualification. There’s NO such thing as FREE!!! Somebody pays for it, either through taxation or paying the interest on Govt bonds. The food doesn’t magically appear out of nowhere, somewhere funds are expended and the increasingly fragile state of non-stop Government entitlements has edged the whole country to an unsustainable level of spending (and yes, I’ll include Farm Subsidies and non-stop QE to Wall Street as well). Too many people count on the Government to meet their needs, make breakfast for their kids, feed them lunch, after school snacks, CALWORK’s babysitting, etc. And if you doubt that, look at the article stating Oakland’s goal of going from 67 percent to 80 percent! Unbelievable. How would you measure them instead Regis?